Dozens arrested as neo-Nazis and anti-fascists clash with police in Gothenburg. 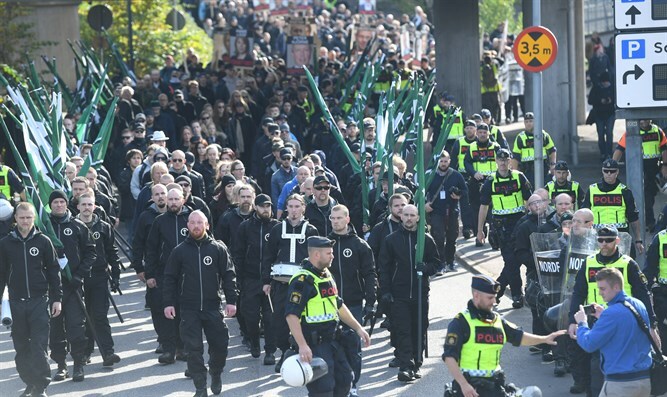 Dozens of people were arrested on Saturday as neo-Nazis and anti-fascists clashed with police during a march by the far-right Nordic Resistance Movement (NMR) in Gothenburg, Sweden, Reuters reported. The NMR gathered hundreds of people for the march. Membership in Nazi organizations is not illegal in Sweden and the NMR had a permit from the police to march. Swedish police said that at least 20 people had been apprehended, and that one police officer was lightly injured. A police spokesman later told Swedish state television SVT that an additional 10 people had been arrested. The police had anticipated violence and had called in reinforcements from all police districts in Sweden, according to Reuters. The route of the march had originally been scheduled to pass near the city’s main synagogue on Yom Kippur. Last week, following appeals by Sweden's Jewish community organizations and the organizers of Gothenburg's Book Fair which also took place this weekend, the Gothenburg Administrative Court decided to shorten the demonstration route and prevented it from passing the book fair or the synagogue, reported Haaretz. “As ardent defenders of freedom of speech — even hateful speech — we would not ask for the neo-Nazi march to be banned. We do implore you, however, to ensure that the Jewish community of Gothenburg ‘feels safe and secure, and is free to flourish,'” ADL’s national director, Jonathan Greenblatt, wrote to Prime Minister Stefan Lofven ahead of the march.